Nursing Care Plans for Acute Renal Failure; Acute renal failure is a syndrome of varying causation that results in a sudden decline in renal function. It is frequently associated with an increase in BUN and creatinine, oliguria (less than 500 ml urine/24 hours), hyperkalemia, and sodium retention (Williams & Wilkins, 2006). Acute renal failure (ARF) is a sudden and almost complete loss of kidney function (decreased Glomerular filtration rate GFR) over a period of hours to days. Acute Renal Failure ARF manifests with oliguria, anuria, or normal urine volume. Oliguria (less than 400 ml/day of urine) is the most common clinical situation seen in Acute Renal Failure ARF; anuria (less than 50 ml/day of urine) and normal urine output are not as common. Regardless of the volume of urine excreted, the patient with ARF experiences rising serum creatinine and BUN levels and retention of other metabolic waste products (azotemia) normally excreted by the kidneys (Brunner and Suddarth,2003 ). Acute renal failure (ARF) is the abrupt deterioration of renal function that results in the accumulation of fluids, electrolytes, and metabolic waste products. The sudden interruption of renal function resulting from obstruction, reduced circulation, or renal parenchymal disease. This condition is classified as prerenal, intrarenal, or postrenal and normally passes through three distinct phases: oliguric, diuretic, and recovery. It’s usually reversible with medical treatment. If not treated, it may progress to end-stage renal disease, uremia, and death. 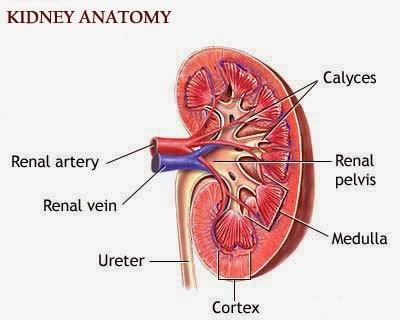 Prerenal conditions occur as a result of impaired blood flow that leads to hypoperfusion of the kidney and a drop in the Glomerular filtration rate GFR. Intrarenal causes of ARF are the result of actual parenchymal damage to the glomeruli or kidney tubules. Intrarenal causes result from injury to renal tissue and are usually associated with intrarenal ischemia, toxins, immunologic processes, systemic and vascular disorders. Postrenal causes of ARF are usually the result of an obstruction somewhere distal to the kidney. Pressure raises in the kidney tubules eventually, the Glomerular filtration rate GFR decreases. Urinary tract obstruction, including: Calculi (stones), Tumors, Benign prostatic hyperplasia, Strictures, Blood clots. The initiation period begins with the initial insult and ends when oliguria develops. The oliguria period is accompanied by a rise in the serum concentration of substances usually excreted by the kidneys (urea, creatinine, uric acid, organic acids, and the intracellular cations [potassium and magnesium]). The minimum amount of urine needed to rid the body of normal metabolic waste products is 400 ml. In this phase uremic symptoms first appear life-threatening conditions such as hyperkalemia develop. The diuresis period, the third phase, the patient experiences gradually increasing urine output which signals that Glomerular filtration has started to recover. Laboratory values stop rising and eventually decrease. Although the volume of urinary output may reach normal or elevated levels, renal function may still be markedly abnormal. Because uremic symptoms may still be present, the need for expert medical and nursing management continues. The recovery period signals the improvement of renal function and may take 3 to 12 months. Laboratory values return to the patient’s normal level. Although a permanent 1% to reduction in the GFR is common, it is not clinically significant. Determine if there is a history of cardiac disease, malignancy, sepsis, or intercurrent illness. Determine if patient has been exposed to potentially nephrotoxic drugs (antibiotics, NSAIDs, contrast agents, solvents). Conduct an ongoing physical examination for tissue turgor, pallor, alteration in mucous membranes, blood pressure, heart rate changes, pulmonary edema, and peripheral edema. Nursing Intervention, Evaluation, Out Come, Patient Teaching and Home Healthcare Guidelines Nursing Care Plans For Acute Renal Failure. Nursing interventions with nursing diagnosis; Excess Fluid Volume, Risk for Infection, Imbalanced Nutrition: Less Than Body Requirements, Risk for Injury, Disturbed Thought Processes. Monitor for signs and symptoms of hypovolemia or hypervolemia because regulating capacity of kidneys is inadequate. Monitor urinary output and urine specific gravity; measure and record intake and output including urine, gastric suction, stools, wound drainage, perspiration (estimate). Monitor serum and urine electrolyte concentrations. Measure blood pressure regularly with patient in supine, sitting, and standing positions. Auscultate lung fields for rales. Inspect neck veins for engorgement and extremities, abdomen, sacrum, and eyelids for edema. Evaluate for signs and symptoms of hyperkalemia, and monitor serum potassium levels. Administer sodium bicarbonate or glucose and insulin to shift potassium into the cells. Administer cation exchange resin (sodium polystyrene sulfonate [Kayexalate]) orally or rectally to provide more prolonged correction of elevated potassium. Watch for cardiac arrhythmia and heart failure from hyperkalemia, electrolyte imbalance, or fluid overload. Have resuscitation equipment on hand in case of cardiac arrest. Instruct patient about the importance of following prescribed diet, avoiding foods high in potassium. Prepare for dialysis when rapid lowering of potassium is needed. Administer blood transfusions during dialysis to prevent hyperkalemia from stored blood. · Monitor acid base balance. Monitor for all signs of infection. Be aware that renal failure patients do not always demonstrate fever and leukocytosis. Remove bladder catheter as soon as possible; monitor for UTI. Use intensive pulmonary hygiene high incidence of lung edema and infection. Carry out meticulous wound care. If antibiotics are administered, care must be taken to adjust the dosage for renal impairment. Work collaboratively with dietitian to regulate protein intake according to impaired renal function because metabolites that accumulate in blood derive almost entirely from protein catabolism. Monitor BUN, creatinine, electrolytes, serum albumin, prealbumin, total protein, and transferrin. Be aware that food and fluids containing large amounts of sodium, potassium, and phosphorus may need to be restricted. Prepare for hyperalimentation when adequate nutrition cannot be maintained through the GI tract. Examine all stools and emesis for gross and occult blood. Administer H2-receptor antagonist, such as cimetidine (Tagamet) or ranitidine (Zantac), or nonaluminum or magnesium antacids as prophylaxis for gastric stress ulcers. If H2-receptor antagonist is used, care must be taken to adjust the dose for the degree of renal impairment. Speak to the patient in simple orienting statements, using repetition when necessary. Maintain predictable routine, and keep change to a minimum. Watch for and report mental status changes somnolence, lassitude, lethargy, and fatigue progressing to irritability, disorientation, twitching, seizures. Use seizure precautions ”padded side rails, airway and suction equipment at bedside. Encourage and assist patient to turn and move because drowsiness and lethargy may prevent activity. Use music tapes to promote relaxation. Prepare for dialysis, which may help prevent neurologic complications. Achieving fluid and electrolyte balance. Remain free from signs or symptoms of circulatory overload. Verbalize the importance of balancing activities with adequate rest periods. Verbalize appropriate food choices according to his prescribed diet. Patient’s oral mucous membrane will remain intact. The patient’s skin integrity will remain intact. Demonstrate skill in managing the urinary elimination problems. Family members will verbalize the effect the patient’s condition has on the family unit. The patient will avoid or minimize complications. Explain that she or he may be more susceptible to infection than previously. Teach the patient or significant others about all medications, including dosage, potential side effects, and drug interactions. Explain that the patient should tell the healthcare professional about the medications if the patient needs treatment such as dental work or if a new medication is added. Explain that ongoing medical assessment is required to check renal function. Explain all dietary and fluid restrictions. Note if the restrictions are life-long or temporary. Tell the patient about his prescribed medications, and stress the importance of complying with the regimen. Stress the importance of following the prescribed diet and fluid allowance. Instruct the patient to weigh him daily and report sudden increase of weight. Advise the patient against overexertion. If he becomes dyspneic or short of breath during normal activity, tell him to report it to his physician. Teach the patient how to recognize edema, and report this finding to the physician.